GMG international offers a huge range of Heat Shrinkable Termination Kits, which are of superior quality and offer excellent performance. These heat shrinkable termination kits are designed for cables of different kvs. These heat shrinkable termination kits are easy to install and designed in compliance with the international design standards. We are looking queries mainly from South Africa and middle east. 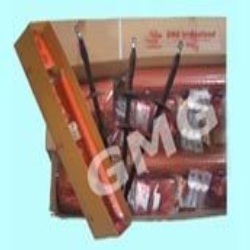 Established in year 1998, GMG International An ISO 9001:2015 Certified Company, is a young and dynamic organization engaged in manufacturing, supplying and wholesaling of a wide array of heat shrinkable jointing kits, cable jointing kits heat shrinkable products, protective tubings such as heat shrinkable tubing, heat shrinkable terminations and heat shrinkable cable joints. Through our dedicated endeavours, we have carved a niche for ourselves in the electrical industry, and power sector. All encompassing assortment of our products comprise of heat shrinkable anti break out, heat sinkable rain sheds, high voltage non-tracking weather resistant protective tubing. Our company is making great strides in the industry under the leadership of Mr. S.P Singh, who is the Chairman of the company. Through his progressive outlook, it has been possible for us to flourish and cater to the diverse demands of the customers. Coupled with a highly advanced infrastructure, our ability to meet the demanding nature of the industry is propelled by our desire to excel in our industry sector.